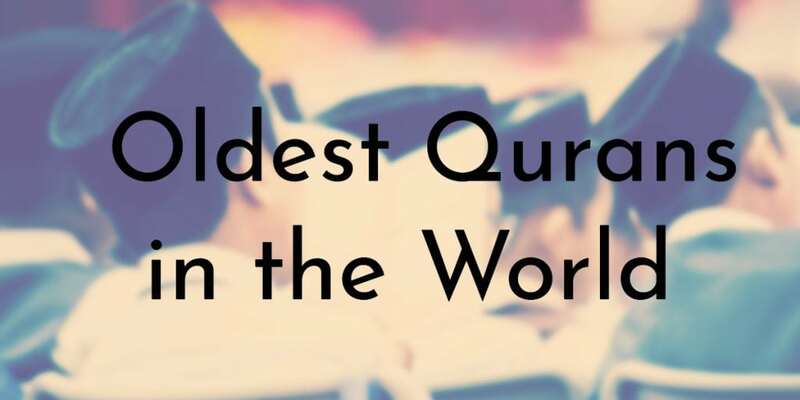 The history of the Quran dates back to around 610 AD when words of the Quran were first revealed to the Islamic Prophet Muhammad. 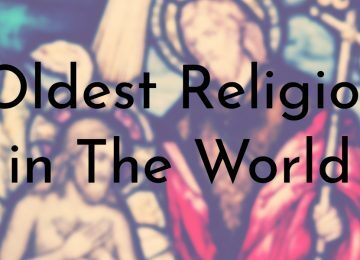 According to Islamic traditions, Muhammad continued to have revelations until he died around 632 AD. After Muhammad’s death his teachings were passed down orally until Uthman ibn Affan the third caliph (political leader of the Islamic government) ordered that official texts of the Quran be made around 651 AD. 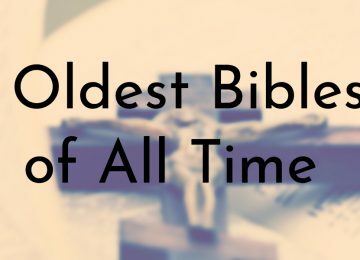 The oldest entries on this list date back to around this time and may possibly be fragments of the Uthman Qurans. The Blue Quran is one of the most famous and beautiful ancient Qurans in the world. The manuscript has been dated to between the late 9th century to the early 10th century; it has been dated as late as 1020 AD. It is believed that the Blue Quran was created for the Great Mosque of Qairawan in Tunisia. The pages are written with gold ink on vellum colored with indigo, giving it a distinct blue color. Writing the Quran in gold on the blue vellum was most likely influenced by the elaborate official documents written by the Christian Byzantine Empire. 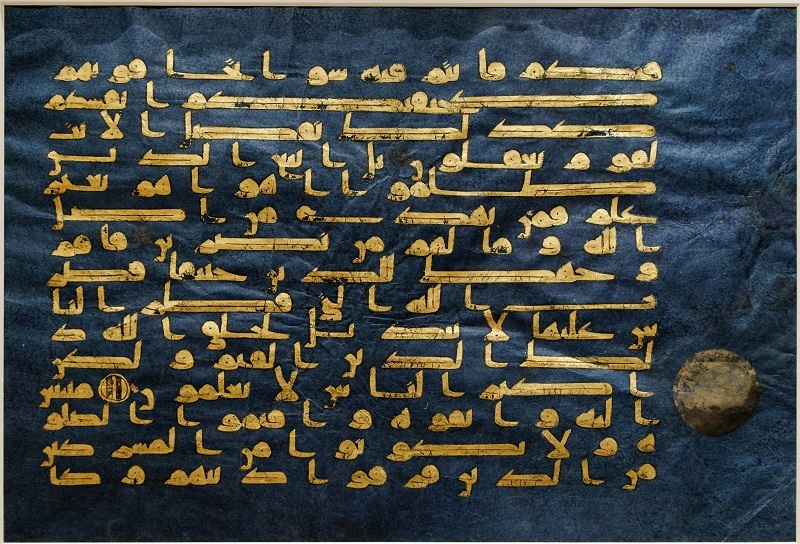 While much of the Blue Quran is preserved by different institutions, in 2012 and 2013 folios were sold at auction, with one folio reportedly selling for over $800,000. 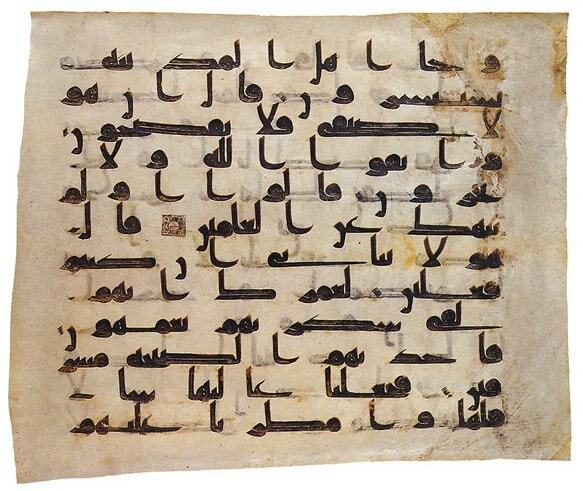 For several years, prior to research conducted in the last few decades, the Samarkand Kufic Quran, was thought to be the oldest copies of the Quran in existence. The date the manuscript was written varies widely from between 595 AD – 855 AD. 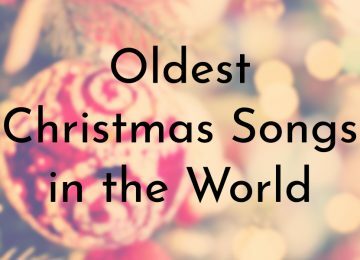 However, most researchers agree that it was most likely written in the 8th or 9th century. This manuscript is revered by the Muslim community as it is believed to be part of a group of Qurans commissioned by the third caliph Uthman in 651 AD. Uthman wanted to produce a standard copy of the Quran 19 years after the death of the Prophet Muhammad. 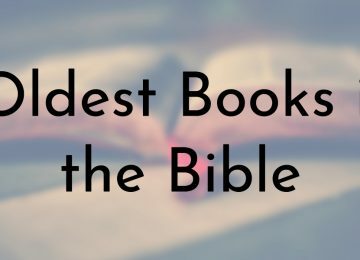 This belief has been challenged by research that shows the manuscript came long after the 7th century. Like the Smarkand Kufic Quran, the Topkapi manuscript was often cited as the oldest Quran for many years. Recent research, however, shows that the Topkapi manuscript is at least a century younger than the oldest existing Quran fragments. The Topkapi manuscript has been dated to about the early to mid 8th century and is a nearly complete text of the Quran. In that respect, it is most likely the oldest near-complete Quran in existence. Also like the Samarkand Quran, the Topkapi manuscript is believed to be an original Quran commissioned by the third caliph Uthman in 651. Research has shown that this is not true and that the manuscript is over a century younger than Uthman’s Qurans. The Codex Parisino-Petropolitanus is a 98 folio Quran manuscript dating back to the late 7th or early 8th century. 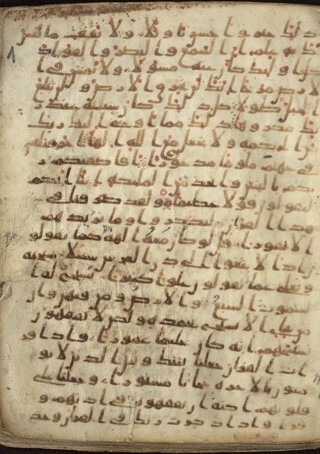 The manuscript was found with several Quranic fragments in the Amr Mosque in Fustat, Egypt. During the Napoleonic expedition in the late 18th century, French scholar Jean-Joseph Marcel bought several of the folios and Jean-Louis Asselin de Cherville bought a few more pages a few years later. 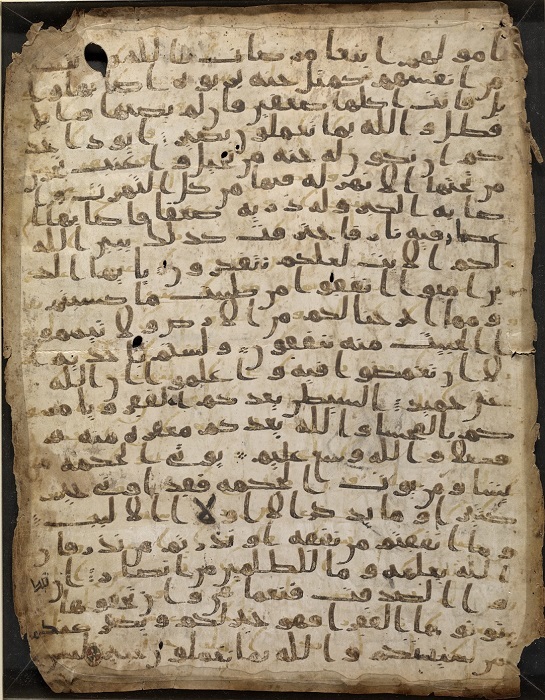 Research conducted by Yassin Dutton suggests that the manuscript may have been written in Syria as it is written in the qira’at (readings/recitations) of Ibn Amir of Damascus, Syria. Today, parts of the manuscript are preserved across four different institutions: the Bibliothèque nationale de France, the National Library of Russia, the Vatican Library, and the Khalili Collection in London. Until recently, the Sana’a manuscript was believed to be the oldest pieces of the Quran in existence. The manuscript was first discovered in 1972 during renovations of the Great Mosque of Sana’a in Yemen. 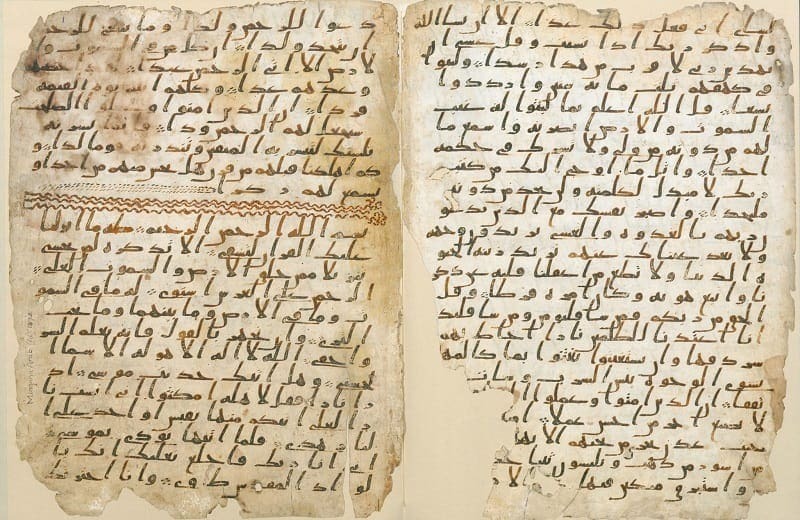 Construction workers uncovered a large cache of Quranic and non-Quranic manuscripts and parchments that were poorly preserved and heavily damaged. 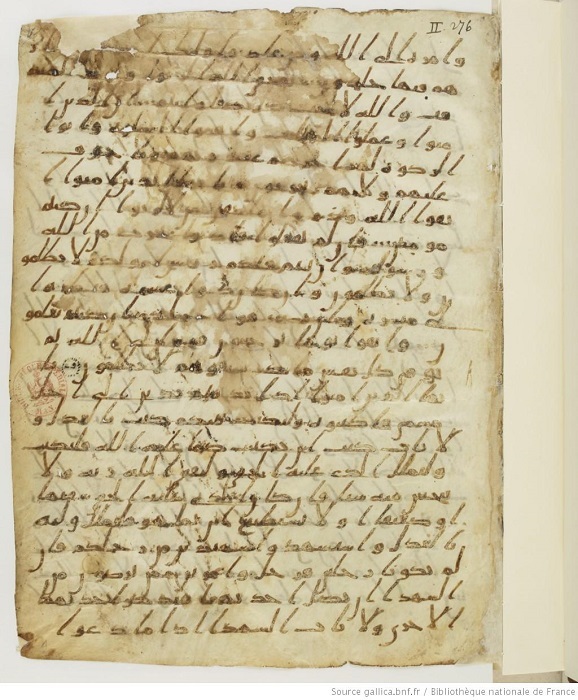 The manuscript was identified as part of the Quran in 1981 and since then, the Yemeni Department for Antiquities – with help from foreign universities – has worked to restore the fragments. It has been radiocarbon dated to between 632 AD – 671 AD, with the lower codex dated with 99% accuracy to 671 AD. The Quran fragment from the University of Tübingen in Germany has been dated to a period between 649 AD – 675 AD. This date means the manuscript was written about 20 – 40 years after the Prophet Muhammad’s death. Pieces of the manuscript were analyzed in a lab in Zürich using modern C14-radiocarbon and dated within a 95.4% statistical probability. The manuscript has been in the university’s possession since the 19th century when first Prussian Consul to Damascus, Johann Gottfried Wetzstein, acquired several ancient Arabic manuscripts. The research into the fragment’s age was conducted as part of a project funded by the German Research Society (DGF) and the corresponding French institution: Agence National de la recherché (ANR). 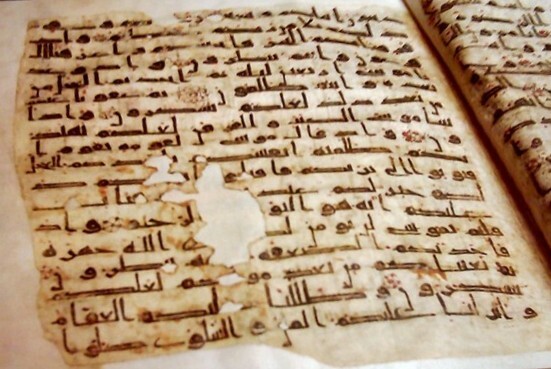 The Birmingham Quran Manuscript is currently believed to be the oldest Quran in the world. This manuscript consists of two leaves of parchment that are a fragment of an early Quranic manuscript dated between 568 AD – 645 AD. Researchers at the University of Birmingham in England dated the parchment to within a 95.4% accuracy. This means that the manuscript may have been written shortly after the Prophet Muhammad died as he is thought to have lived between 570 AD – 632 AD. The manuscript contains text from suras (chapters) 18 – 20 and is written in Arabic Hijazi script. May Allah reward you for this, amin. 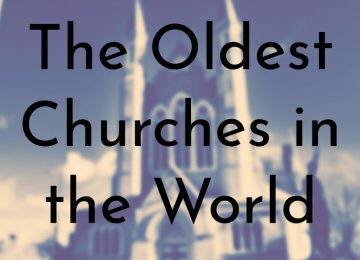 Is there any manuscript that is complete and dates back to the lifetime of the Prophet himself?